"Chargers" redirects here. For other uses, see Charger (disambiguation). The Los Angeles Chargers are a professional American football team based in the Greater Los Angeles Area. The Chargers compete in the National Football League (NFL) as a member club of the league's American Football Conference (AFC) West division. The team was founded on August 14, 1959, and began play on September 10, 1960, as a charter member of the American Football League (AFL), and spent its first season in Los Angeles, before moving to San Diego in 1961 to become the San Diego Chargers. The Chargers joined the NFL as result of the AFL–NFL merger in 1970, and played their home games at SDCCU Stadium. The return of the Chargers to Los Angeles was announced for the 2017 season, just one year after the Rams had moved back to the city from St. Louis. The Chargers will play their home games at Dignity Health Sports Park until the 2020 opening of the Los Angeles Stadium at Hollywood Park, which they will share with the Rams. The Chargers won one AFL title in 1963 and reached the AFL playoffs five times and the AFL Championship four times before joining the NFL (1970) as part of the AFL–NFL merger. In the 43 years since then, the Chargers have made 13 trips to the playoffs and four appearances in the AFC Championship game. In 1994, the Chargers won their lone AFC championship and faced the San Francisco 49ers in Super Bowl XXIX, losing 49–26. The Chargers have eight players and one coach enshrined in the Pro Football Hall of Fame in Canton, Ohio: wide receiver Lance Alworth (1962–1970), defensive end Fred Dean (1975–1981), quarterback Dan Fouts (1973–1987), head coach–general manager Sid Gillman (1960–1969, 1971), wide receiver Charlie Joiner (1976–1986), offensive lineman Ron Mix (1960–1969), tight end Kellen Winslow (1979–1987), linebacker Junior Seau (1990–2002), and running back LaDainian Tomlinson (2001–2009). The Los Angeles Chargers were established with seven other American Football League teams in 1959. In 1960, the Chargers began AFL play in Los Angeles. The Chargers' original owner was hotel heir Barron Hilton, son of Hilton Hotels founder Conrad Hilton. According to the official website of the Pro Football Hall of Fame, Barron Hilton agreed after his general manager, Frank Leahy, picked the Chargers name when he purchased an AFL franchise for Los Angeles: "I liked it because they were yelling ‘charge’ and sounding the bugle at Dodger Stadium and at USC games." The Chargers initially considered playing at the Rose Bowl, but instead signed a lease to play at the Los Angeles Coliseum. There is also an alternative theory about a man named Gerald Courtney of Hollywood who won an all-expenses-paid trip to Mexico City and Acapulco for submitting "Chargers" in a name-the-team contest. The Chargers only spent one season in Los Angeles before moving to San Diego in 1961. From 1961 to 1966 their home field was Balboa Stadium in Balboa Park. As of August 1967, they moved to the newly constructed SDCCU Stadium (then named San Diego Stadium), where they played their home games until 2016. They played for the whole ten-season existence in the AFL before the upstart league merged with the older NFL. Their only coach for the ten-year life of the AFL was Sid Gillman, a Hall of Famer who was widely recognized as a great offensive innovator. The early AFL years of the San Diego Chargers were highlighted by the outstanding play of wide receiver Lance "Bambi" Alworth with 543 receptions for 10,266 yards in his 11-AFL/NFL-season career. In addition he set the pro football record of consecutive games with a reception (96) during his career. With players such as Alworth, Paul Lowe, Keith Lincoln and John Hadl, the high-scoring Chargers won divisional crowns five of the league's first six seasons and the AFL title in 1963 with a 51–10 victory over the Boston Patriots. They also played great defense, as indicated by their professional football record 49 pass interceptions in 1961, and featured AFL Rookie of the Year defensive end Earl Faison. The Chargers were the originators of the term "Fearsome Foursome" to describe their all-star defensive line, anchored by Faison and Ernie Ladd (the latter also excelled in professional wrestling). The phrase was later appropriated by various NFL teams. Hilton sold the Chargers to a group headed by Eugene Klein and Sam Schulman in August 1966. The following year, the Chargers began "head to head" competition with the older NFL with a preseason loss to the Detroit Lions. The Chargers defeated the defending Super Bowl III champion New York Jets 34–27 before a record San Diego Stadium crowd of 54,042 on September 29, 1969. Alworth once again led the team in receptions with 64 and 1,003 yards with four touchdowns. The team also saw Gillman step down due to health and offensive backfield coach Charlie Waller promoted to head coach after the completion of the regular season. Gillman did remain with the club as the general manager. In 1970, the Chargers were placed into the AFC West division after the completion of the AFL/NFL merger. But by then, the Chargers fell on hard times; Gillman, who had returned as general manager, stepped down in 1971, and many of the Chargers players from the 1960s had already either retired or had been traded. The Chargers acquired veteran players like Deacon Jones and Johnny Unitas; however, it was at the later stages of their careers and the team struggled, placing third or fourth in the AFC West each year from 1970 to 1978. During the 1973 season, the Chargers were involved in the first major drug scandal in the NFL. That same year, however, a rookie quarterback from Oregon named Dan Fouts would serve as the catalyst to the Chargers' return to prominence as the 1970s wore on. Hall of Fame Charger Kellen Winslow, who played with San Diego from 1979-1987, is considered to be one of the NFL's all-time tight ends. San Diego hired head coach Don Coryell in 1978, who would remain coaching the team until 1986. Coryell developed an offensive scheme and philosophy known as Air Coryell, also known as the "Coryell offense" or the "vertical offense". With Dan Fouts as quarterback, the San Diego Chargers' offense was among the greatest and most exciting passing offenses in National Football League history, setting league and individual offensive records. The Chargers led the league in passing yards an NFL record six consecutive years from 1978 to 1983 and again in 1985. They also led the league in total yards in offense 1978–83 and 1985. Under the tutelage of Coryell, Dan Fouts, wide receiver Charlie Joiner, and tight end Kellen Winslow blossomed on the field and would all be inducted into the Pro Football Hall of Fame. The Chargers earned four consecutive playoff appearances (1979–82) during the Air Coryell era, including three AFC West division championships (1979–81). 1978 was marked by the "Holy Roller" game, or as Chargers fans call it, the "Immaculate Deception". It was a game-winning play executed by the Oakland Raiders against the Chargers on September 10, 1978, in San Diego at Jack Murphy Stadium. With 10 seconds left in the game, the Raiders had possession of the ball at the Chargers' 14-yard line, down 20–14. Raiders quarterback Ken Stabler took the snap and found himself about to be sacked by Chargers linebacker Woodrow Lowe on the 24-yard line. Stabler fumbled the ball forward, and it rolled forward towards the San Diego goal line. Running back Pete Banaszak tried to recover the ball on the 12-yard line, but could not keep his footing, and the ball was pushed even closer to the end zone. Raiders tight end Dave Casper was the next player to reach the ball but he also could not get a hand on it. He batted and kicked the ball into the end zone, where he fell on it for the game-tying touchdown as time ran out. With the ensuing extra point by kicker Errol Mann, the Raiders won 21–20. What many Chargers fans believed should have been called an incomplete pass (and possibly intentional grounding) was seen as a fumble and the rest of the play involved batting of the ball forward towards the end zone where the Raiders ultimately recovered it for a touchdown. As a result of this play, NFL rules were changed so that, in the last two minutes of a half or game, or on fourth down at any time in the game, the only offensive player allowed to advance a fumble is the player who originally fumbled. If any other offensive player recovers the fumble and advances the ball, after the play the line of scrimmage is the spot of the original fumble. 1979 marked a turning point for the Chargers franchise as The Sporting News named team general manager John Sanders NFL Executive of the Year after balloting of other NFL executives. Fouts set an NFL record with his fourth consecutive 300-yard passing game, in a game in which he threw for 303 yards against the Raiders. Coached by Don Coryell and featuring Fouts throwing to tight end Kellen Winslow and wide receivers John Jefferson and Charlie Joiner, they clinched their first playoff berth in 14 years with a 35–0 victory against the New Orleans Saints. On December 17, the Chargers defeated the Denver Broncos 17–7 for their first AFC West division title since the AFL–NFL merger before a national Monday Night Football television audience and their home crowd. Their time in the playoffs was short as they would lose to the Houston Oilers 17–14 in the divisional round. Ron Mix became the second AFL player and second Chargers player to be named to the Pro Football Hall of Fame, during halftime of the AFC-NFC Pro Bowl. 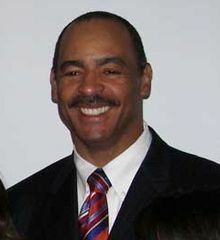 In 1980 the team traded for running back Chuck Muncie, and Fouts set a club record with 444 yards passing in the Chargers' 44–7 victory over the New York Giants. Kellen Winslow caught 10 passes for 171 yards and Chargers clinched their second straight AFC West title by defeating the Pittsburgh Steelers 26–17 and finished the regular season with an 11–5 record. Jefferson (1,340), Winslow (1,290), and Joiner (1,132) became the first trio on the same team to have 1,000 yards receiving in a season. The Chargers' defense led the NFL in sacks (60) spearheaded by the frontline of 1975 Chargers' draftees Fred Dean, Gary "Big Hands" Johnson and Louie Kelcher. The trio, along with Leroy Jones formed a defensive frontline that was locally nicknamed Bruise Brothers. In the playoffs, they won the divisional round 20–14 over the Buffalo Bills. However, they fell one game shy of Super Bowl XV in a 34–27 loss to the eventual champion Raiders. Dan Fouts led the Chargers to several postseason runs from 1979–1982, including the famous "Epic in Miami" 1981 AFC Divisional Playoff game. In 1981, the Chargers won their third straight AFC West title with a 10–6 season. After the division titles of the 1979 and 1980 seasons, contract disputes arose and owner Klein refused to renegotiate players' contracts. They traded wide receiver John Jefferson to the Green Bay Packers after he held out for an increase in salary but replaced him with Wes Chandler. Defensive end Dean also became involved in a holdout and was traded to the 49ers. Dean contends he was making the same amount of money as his brother-in-law who was a truck driver. Dean won UPI NFC Defensive Player of the Year (while playing in only 11 games) that same year en route to a Super Bowl victory and helped the 49ers to another Super Bowl title two years later. Dean's loss was particularly damaging to the Chargers' Super Bowl chances as the defense weakened afterwards, surrendering the most passing yards in the NFL in both 1981 and 1982. In the 1981 playoffs, the Chargers outlasted the Miami Dolphins in the divisional round, 41–38, in a game that became known as The Epic in Miami. The game was voted as the best game in NFL history by a panel of ESPN journalists. The temperature was 85 °F with high humidity (29.4 °C) at the Miami Orange Bowl, but it did not stop either team's offense. The Chargers were led by quarterback Dan Fouts who made the Pro Bowl for the third year in a row, setting an NFL single-season record at that time of 4,802 yards and 33 touchdowns. The Dolphins were led by head coach Don Shula and featured a defense that gave up the fifth-fewest points in the NFL in the regular season. This game set playoff records for the most points scored in a playoff game (79), the most total yards by both teams (1,036), and most passing yards by both teams (809). Chargers placekicker Rolf Benirschke eventually kicked the winning 29-yard field goal after 13:52 of overtime to help San Diego beat Miami, 41–38. The image of an exhausted tight end Kellen Winslow, who finished the game with 13 receptions for 166 yards and a touchdown and one blocked field goal, being helped off the field by two of his Chargers teammates has been replayed countless times. Winslow was voted to the Pro Football Hall of Fame in 1995. The win sent the Chargers to their second straight AFC Championship game. However, the eventual AFC Champion Cincinnati Bengals, playing in their first AFC Championship Game, defeated the Chargers 27–7 in what became known as the Freezer Bowl. The temperature of −9° with a wind-chill factor of −59° made this the coldest weather conditions for a title game in the history of the NFL. Chargers' owner Eugene Klein tried to get the NFL and Bengals to postpone the game but he was turned down. During the strike-shortened 1982 season, Fouts averaged what was then a record of 320 yards passing per game. Highlights that season included back-to-back victories against the 1981 Super Bowl teams San Francisco (41–37) and Cincinnati (50–34) in which Fouts threw for over 400 yards in each game to lead the Chargers to shootout victories. The Chargers made it back to the playoffs, but after beating the Steelers in the first round, they lost to the Dolphins 34–13 in a rematch of their playoff game from the previous season. That loss began a slide for the Chargers, who from 1983 to 1991 failed to make the playoffs every season. In 1984, Klein cut salary in preparation of selling the team, sending defensive linemen Johnson and Kelcher to San Francisco, where they would join Dean and offensive tackle Billy Shields for another 49ers championship in Super Bowl XIX. Alex Spanos purchased a majority interest in San Diego from Klein on August 1. Alex G. Spanos still owns 97% of the team and until his death in 2016, George Pernicano owned the other 3%. Benirschke was named "Miller Man of the Year" and Joiner set an NFL record with his 650th pass reception in the fourth quarter of the game at Pittsburgh. In 1985 guard Ed White set an NFL record by playing in 241 NFL games, most all-time among offensive linemen. Lionel "Little Train" James, a mere 5'6" and 171 pound running back, set NFL record of 2,535 all-purpose yards while also setting a record of 1,027 receiving yards by a running back. Al Saunders was named the seventh head coach in Chargers history in 1986 following the resignation of Coryell. In 1987, Joiner retired from playing, and became the Chargers' wide receivers coach. The Chargers finished with an 8–7 record, their first winning record since 1982, despite winding up with six straight losses that cost them any chance at a playoff berth. In 1988, Fouts retired after a 15-year career in which he set seven NFL records and 42 club records, and became the NFL's second most prolific passer of all-time with 43,040 yards. Fouts' jersey number (14) was retired at halftime of "Dan Fouts Day" game in San Diego. In 1989, Dan Henning, a former Chargers quarterback, Washington Redskins assistant, and Atlanta Falcons head coach, was named the eighth head coach in Chargers history. First-year running back Marion Butts set a club record with 39 carries and a team rookie record with 176 yards in Chargers' 20–13 win in Kansas City. After a three-year stint as Director of Football Operations, Steve Ortmayer was released after the season and replaced by Bobby Beathard. Following Henning's three-season stint with the Chargers, Bobby Ross was hired as the ninth head coach in 1992. Additionally, the Chargers acquired quarterback Stan Humphries in a trade with the Washington Redskins. The Chargers would lose their first four games of the season and come back to become the first 0–4 team to make the playoffs as they won 11 of the last 12 games and clinched the AFC West title. Ross was named NFL Coach of the Year for the Chargers' dramatic turnaround by Pro Football Weekly. In the first round of the playoffs, the Chargers shut out the Chiefs 17–0, but the Dolphins shut out the Chargers in the divisional playoffs to eliminate the Chargers. In 1993, the Chargers finished 8–8 (fourth in their division). In the 1994 season, the Chargers made their first and, so far, only Super Bowl appearance, against the 49ers in Super Bowl XXIX. They got to the Super Bowl by winning their first six regular season games, the only NFL team to do so in 1994, and finished the season 11–5. Quarterback Stan Humphries and wide receiver Tony Martin combined on a 99-yard touchdown completion to tie an NFL record during a defeat of the Seattle Seahawks, 27–10. They would become the 1994 AFC West Division champions behind a defense led by linebacker Junior Seau, defensive tackles Reuben Davis and Shawn Lee, defensive end Leslie O'Neal and an offense keyed by running back Natrone Means, Humphries and Martin. The Chargers had upset victories over the Dolphins and Steelers in the AFC playoffs. Despite those two close triumphs (22–21 against the Dolphins in the Divisional Round, and 17–13 against the Steelers in the AFC Championship Game), the Chargers lost Super Bowl XXIX to the San Francisco 49ers by a score of 49–26, who were led by quarterback Steve Young (Super Bowl MVP) and wide receiver Jerry Rice. Despite the lopsided loss in the Super Bowl, Beathard, who traded for or drafted the bulk of the Chargers roster, and who hired coach Ross, was named the NFL's smartest man by Sports Illustrated, and became the only general manager to lead three different teams to the Super Bowl (Chargers, Dolphins, Redskins). The Chargers' follow-up year in 1995 did not bring the same success of the previous season, but the team still managed to get into the playoffs with a five-game winning streak to end the season at 9–7. However, in the first round, the Chargers were eliminated by the Indianapolis Colts in a 35–20 defeat. In 1996, running back Rodney Culver and his wife, Karen, were killed in the crash of ValuJet Flight 592 in the Florida Everglades. Culver was the second player in team history to die while on the active roster after David Griggs was killed in a one-car accident in Davie, Florida, 11 months earlier. In 1997, Ross and Beathard were at odds with one another, resulting in Ross and his staff being released. The Chargers selected Kevin Gilbride to become their new head coach. Gilbride, whose coaching background with the Jacksonville Jaguars and Oilers featured a more open passing attack, would mark a major change in offensive style from the ball control ground game of Ross. Beathard drafted quarterback Ryan Leaf after the Indianapolis Colts selected Peyton Manning with the first pick in the 1998 NFL Draft. The Chargers traded several players and draft choices to the Arizona Cardinals in order to move up to the second pick and select Leaf. Leaf turned out to be arguably the biggest bust in NFL history. His poor play and attitude caused his departure after the 2000 season. In 1998, the Chargers went 5–11. Said safety Rodney Harrison, "If I had to go through another year like that, I'd probably quit playing." The Chargers drafted running back LaDainian Tomlinson in the 2001 NFL Draft. He became their all-time rushing leader. The Chargers struggled in pass protection, resulting in Humphries suffering several concussions and his retirement from the game. Gilbride was replaced by interim head coach June Jones, who was on the Chargers' staff before the hire. Jones left the team at the end of the season to coach at the University of Hawaii and the Chargers named former Oregon State University head coach Mike Riley as their new head coach. Leaf wound up having a disappointing career with the Chargers after a great deal of controversy with both Chargers management as well as the press and his teammates. His failure to be the player the team envisioned was seen as a black mark on the franchise and is generally considered one of the worst draft/trades in the history of pro football. Quarterback Jim Harbaugh, who was acquired in a trade with the Baltimore Ravens for a conditional draft choice in 2000, became the Chargers starting quarterback. Beathard retired in April 2000 and was replaced in January 2001 by John Butler, former general manager of the Bills. From 1996 to 2003, the Chargers had eight straight seasons where they were .500 or worse. In 2001, Norv Turner, the former head coach of the Redskins, was named offensive coordinator by Riley. Turner installed the offense that he coached with the Dallas Cowboys under Jimmy Johnson. Turner learned the offense from Ernie Zampese, former offensive coordinator during the Coryell era, while the two were on the Los Angeles Rams coaching staff. The Chargers signed Heisman Trophy winner free agent quarterback Doug Flutie, formerly with the Bills, and traded the team's first overall selection in the 2001 NFL Draft to the Atlanta Falcons for their first-round selection (5th overall) and third-round selection in the same draft. In addition the Chargers obtained wide receiver-kick returner Tim Dwight and the Falcons' second-round draft selection in the 2002 NFL Draft. The Chargers used that selection in the 2001 draft to select Texas Christian University running back LaDainian Tomlinson and their own first pick in the second round to select Purdue University quarterback Drew Brees. Hired as a replacement to Riley, Marty Schottenheimer's Chargers squad opened the 2002 season with four-straight victories, making him the only coach in team history to win his first four games. Butler would succumb to cancer after a nine-month struggle in April 2003. Replacing Butler was A. J. Smith, who was named Executive Vice President-General Manager, replacing his close friend. Smith and Butler had worked together with the Bills, playing key roles with Buffalo's Super Bowl teams. In 2003, the Chargers traded Seau to the Dolphins for a draft pick in 2004 NFL Draft. Seau was selected to 2003 Pro Bowl, his 12th Pro Bowl selection of his career, and in his final season with the Chargers, he was chosen by teammates as the recipient of the Emil Karas Award as the team's Most Inspirational Player. Also in 2003, Tomlinson accumulated 195 total yards from scrimmage in a late-season game against the Packers to raise his season total to 2,011 and became the first player in team history and the eighth player in NFL history to record consecutive 2,000-yard seasons. Tomlinson also became the first player in NFL history to rush for 1,000 yards and catch 100 passes in the same season. The Chargers coveted Eli Manning and wanted to select him with their first round pick, which was also the first overall pick of the draft. However, after Eli Manning indicated before the draft that he would not sign with the San Diego Chargers, they were forced to adjust their plans. Philip Rivers was their first alternative to Manning because the Chargers head coach at the time, Marty Schottenheimer, had coached Rivers at the Senior Bowl and he liked what he saw from Rivers. The Chargers agreed to a trade on draft day with the New York Giants. Manning was selected by the San Diego Chargers then later in the draft traded for Rivers, selected with the fourth pick by the Giants. The Chargers also received draft picks from the Giants that were used to select future Pro Bowlers Shawne Merriman and Nate Kaeding. Rivers was one of seventeen quarterbacks taken in the 2004 NFL Draft along with Ben Roethlisberger, Eli Manning, and Matt Schaub. Rivers, Roethlisberger, Schaub and Manning have been voted to the Pro Bowl since becoming starters, none had produced a season with a losing record until Schaub in 2010, but Roethlisberger and Manning both have won two Super Bowls. They have been compared favorably to the Quarterback class of 1983, which included Hall of Fame quarterbacks John Elway (1st pick), Jim Kelly (14th), and Dan Marino (27th). In August 2004, Rivers signed a six-year, $40.5 million contract that included $14.5 million in signing bonuses. However, due to a protracted contract negotiation, Rivers only reported to the team during the last week of training camp, and incumbent Drew Brees retained his starting job. After the starting quarterback switch, it was almost certain Brees' days as the Chargers' starting QB were over. However, Rivers held out nearly all of training camp, and Brees remained the starter throughout the 2004 season, where he started 15 games and led the team to a 12-4 regular season record. Brees posted spectacular numbers, completing 65.5% of his passes for 3,159 yards, with 27 touchdowns to only 7 interceptions, giving him a 104.8 passer rating. The Chargers won the AFC West and Brees was selected to the 2004 Pro Bowl. He was named 2004 NFL Comeback Player of the Year. Marty Schottenheimer was named NFL Coach of the Year for the 2004 NFL season. He led the team to a playoff appearance, his 12th as a head coach. However, it resulted in a disappointing loss to the underdog New York Jets in overtime in 2005. During the 2005 NFL Draft, the Chargers tried to get some key rookies that would help carry the momentum from their mostly successful 2004–05 run. They used their first pick on LB Shawne "Lights Out" Merriman from the University of Maryland. Then, they used their next pick on DT Luis Castillo from Northwestern University. Their other choices were WR Vincent Jackson from Northern Colorado, RB Darren Sproles from Kansas State, OT Wesley Britt from University of Alabama, OT Wes Sims from Oklahoma University, and Center Scott Mruczkowski from Bowling Green State. The Chargers got off to a rough start in their 2005 campaign, losing a close one to the Dallas Cowboys in their Week 1 home-opener (28–24) and then they lost on the road to their AFC West rival, the Denver Broncos (20–17). It wasn't until a Week 3 home game on Sunday night that they got their first win of the season, when Eli Manning and the New York Giants got "shocked to the system" as LaDainian Tomlinson had one of the greatest games of his career. He got 220 total yards, had 3 rushing touchdowns, and threw for a touchdown as he helped the Chargers win 45–23. A week later, they were able to build off their win by not only beating the two-time defending champion New England Patriots 41–17, but also ending the Pats' 21-game winning streak at home. In their Week 5 Monday Night home game against the Pittsburgh Steelers, the Chargers wore their throw-back uniforms during this season (they had also worn them during the 1994 season). The Steelers held on to win with a 40-yard field goal by Jeff Reed (24–22). The Chargers rebounded on the road against their division rival Oakland Raiders (27–14). In their Week 7 road trip to Philadelphia, they hoped to build off their win against the Eagles. Late in the game, with the Chargers leading 17–13, the Chargers tried to go for a field goal to put their lead well out of reach, but it got blocked and Eagles DB Matt Ware returned it 65 yards for the game-winning touchdown and the Chargers fourth loss of the season. After going 3–4, the Chargers turned things around as they began a five-game winning streak. They won at home against division-rival Kansas City Chiefs (28–20) and on the road against the New York Jets (31–26). Coming off their Week 10 bye, they went home and wore their throw-back uniforms again. This time, it was a dominating performance as the Chargers man-handled the Buffalo Bills, 48–10. Then, they went on the road and won a close match against the Washington Redskins (23–17 in OT) and then they swept the Oakland Raiders at home by a score of 34–10. The Chargers were 8–5, coming off a 23–21 loss to the Miami Dolphins. On December 18, the Chargers beat the undefeated Indianapolis Colts 26–17, snapping a 13–0 winning streak. However, despite a record of 9–6, they were officially eliminated from AFC playoff contention in 2005 after a 20–7 loss to the Kansas City Chiefs the following Saturday. The Chargers lost their final game of the season by a score of 23–7 to the AFC West champion Denver Broncos to finish with a record of 9–7. The Chargers delivered an impressive performance in 2006, losing only to the Ravens and Chiefs; they finished 14–2 which secured them the #1 AFC seed in the playoffs. However, they lost 24-21 to the New England Patriots in the divisional round. Following the 2006 season, they replaced Schottenheimer with new head coach Norv Turner. In 2007, they went 11-5, beating the Tennessee Titans and the defending champion Indianapolis Colts to reach the AFC title game. However, they fell to the Patriots for the second year in a row. In 2008, the Chargers dropped to 8–8, but as the AFC West was unusually weak that year, they still managed to win the division title. Defeating the Colts in the wild card round, they lost to the Pittsburgh Steelers in the divisional round. San Diego began the 2009 season 2–3. After losing to the Broncos on Monday night, they began an unbroken winning streak for the rest of the season, which included defeating the entire NFC East. In Week 11, they avenged their earlier loss against the Broncos by inflicting a 32–3 rout on them. The next game saw them beat a 1–11 Cleveland Browns squad 30-23, in which LaDainian Tomlinson broke Hall of Famer Jim Brown's rushing record and was congratulated by him afterwards. The Chargers secured another division title, the #2 AFC seed, and looked to be a near shoo-in for the Super Bowl. However, the team's postseason futility continued. Hosting the New York Jets on January 17, 2010, they endured an upset defeat, where, despite an early lead, were unable to overcome the strong Jets' defense. Kicker Nate Kaeding also missed three field goal and PAT attempts, which resulted in the Chargers losing 17–14. The 2010 season was the 1st season without LaDainian Tomlinson since 2000 (Tomlinson was let go by management due to an oversized contract relative to production and other issues; he went on to lead the Jets in rushing with 914 yards & tied for 3rd in receptions with 52). The 2010 campaign started off slowly again, this time 2–5 (including losses to some of the worst teams in football at the time – the Kansas City Chiefs, the Oakland Raiders, the Seattle Seahawks and the St. Louis Rams). The losses were due to turnovers & mental mistakes by young players on special teams allowing blocked punts & kick/punt return touchdowns. The loss to Oakland ended their 13-game winning streak against the Raiders since their last loss on September 28, 2003. The Chargers then went on another second half run with four straight wins but this time instead of keeping the streak going the entire second half they had a big let down losing at home to the Raiders again, this time 28–13 (ending their shared NFL record, with the Dolphins, of 18 straight wins in December). Despite the loss, they still had a chance to win their 5th straight AFC West title, tying the Raiders, but they had another bad loss at the Bengals 34–20 ending their chances. The Chargers beat Denver to end the season with a 9–7 record & out of the playoffs for the first time since 2005. They finished the season as the 8th team in NFL history to rank #1 in overall offense (395.6 yards/game), and overall defense (271.6 yards/game), and became only the 2nd of those teams to not make the playoffs (1953 Eagles 7–4–1). They were second to the Colts in passing yards per game (282.4), second to the Patriots in points scored per game (27.6), 1st in passing yards allowed per game (177.8), 4th in rushing yards allowed per game (93.8), and tied for 2nd in sacks (47). On the negative stat sheet, they gave up the most punt return yards per game (18.9) & had 29 turnovers. Philip Rivers had another great season with a career-high 4,710 yards (#1 in the NFL), 294 yards passing per game (tied for 1st with Manning), 66% completion pct. (third to Brees & Manning), 30 TD's, only 13 INT's & a 101.8 passer rating (second to Brady). Mike Tolbert 11 rushing TD's & Antonio Gates 10 receiving TD's were among the league leaders in TD's scored. On defense, Shaun Phillips' 11 sacks were in the top 10. With the special teams failure of the 2010 season campaign, the Chargers hoped to rebound with a strong performance to start the season, and a way to overcome slow starts. The Chargers started off the 2011 season with a 4–1 campaign, with their only loss to the New England Patriots. From that point on, however, the Chargers began a six-game skid with losses to the Jets, Chiefs, Packers, Raiders, Bears, and Broncos, with the first four by only a score and against Denver in overtime. Injuries to both the offensive and the defensive line hit the Chargers hard. But finally on December 5, 2011, the Chargers got their first win in over a month against the Jacksonville Jaguars, beating the also-struggling team. The Chargers then began a three-game winning streak most notably beating the Ravens by more than any team has beat them that season. However, the Chargers were beaten, 38–10, by the Detroit Lions to drop their record to 7–8 and eliminate the possibility of being in the playoffs. After a 38–26 victory over the Raiders in week 17, the Chargers finished at 8–8 and in a numerical tie for first place in the AFC West along with Oakland and Denver. However, the Chargers were beaten out by Denver for the Division Title via tie-breaker. After missing the playoffs for the third straight season in 2012, the Chargers fired general manager Smith and head coach Turner. The Chargers made offseason changes including a new General Manager, Tom Telesco, and head coach, Mike McCoy, the former offensive coordinator for the Denver Broncos. On January 9, 2013, the Chargers announced that Tom Telesco, former Vice President of Football Operations with the Indianapolis Colts, would take over as General Manager following the firing of A. J. Smith. On January 15, 2013, Broncos offensive coordinator, Mike McCoy, was hired as the new head coach and Ken Whisenhunt as offensive coordinator. The Chargers finished the 2013 season 9-7 and made the playoffs for the first time since 2009. They entered the playoffs as the sixth seed. On January 5, 2014, the Chargers defeated the Cincinnati Bengals at Paul Brown Stadium (27-10) to advance to the AFC Divisional Playoff Round. The Chargers then lost to the Denver Broncos at Sports Authority Field at Mile High the following Sunday, January 12, 2014 (24-17). After starting the season strongly, including a five-win run in September and October, the Chargers were beset by a string of injuries to key players, and eventually finished the season at 9-7. In contrast to 2013, the record was not enough to make the playoffs. The Chargers began the season 5–1, winning five straight after losing their season opener. It was followed by a three-game losing streak, and they finished 4–4 in the second half. They won just two of their final five games, coming back from double-digit fourth quarter deficits twice to remain in playoff contention. They lost the final game of the season when a win would have secured a playoff berth. In three of their last four games, and five of their last eight, the Chargers did not score more than one touchdown. Compared to 2013, the offense dropped in points (from 12th in the league to 17th), yards (5th to 18th), first downs (3rd to 15th), net yards per pass (2nd to 8th), rushing yards (13th to 30) and yards per rush (21st to 31st). It was the second time in three years the team finished second-to-last in yards per carry. San Diego was just 2–4 against teams in their division in the AFC West, and were swept by both the Denver Broncos and the Kansas City Chiefs. It was their worst intradivision record since they were 1–5 in 2003. The Chargers were only 3–6 against teams with winning records. They matched their 9–7 record from 2013, but missed the playoffs for the fourth time in five seasons. During the season, the Chargers, the St. Louis Rams, and the Oakland Raiders all intimated they might apply for relocation to Los Angeles at the end of the season. The Chargers announced in December 2014 that they would not be seeking to relocate for the 2015 season, followed by an announcement from the NFL that no team would relocate to L.A. until the 2016 season at the earliest. Controversy filled the 2015 offseason, as attorney and team spokesperson Mark Fabiani continually bashed the local San Diego city government's efforts to negotiate a replacement for Qualcomm Stadium. When then-St. Louis Rams owner Stan Kroenke announced in January 2015 his intention to build a new stadium in Inglewood, the Chargers felt pressured to announce their own Los Angeles plan to preserve what they claimed was "25 percent of their fan base" in the affluent Los Angeles and Orange County areas. In February 2015, the team announced a stadium proposal in Carson, in partnership with the Oakland Raiders, their AFC West divisional rivals. The 2015 season started off with a win against the Detroit Lions at home. The Chargers lost to the Cincinnati Bengals and Minnesota Vikings on the road before defeating the Cleveland Browns on a last second field goal. Following their 2–2 start, the Chargers lost their next six games, dropping to 2–8. In their six straight losses, they lost heartbreakers to the Pittsburgh Steelers, Green Bay Packers, Baltimore Ravens and the Chicago Bears, as well as sound defeats by both, division rivals, the Oakland Raiders and the Kansas City Chiefs. They finally broke their losing streak by defeating the Jacksonville Jaguars on the road, bringing their record to 3–8, in last place in the AFC West and 3rd worst in the American Football Conference (one game ahead of both the Browns and the Tennessee Titans). They are also tied for the third worst record in the National Football League. They then proceeded to beat the Miami Dolphins in Week 14 winning 30–14. They finished the season 4–12. The day following the conclusion of the 2015 regular season, the Chargers, Rams, and Raiders all filed to relocate to Los Angeles. On January 12, 2016, the NFL owners voted 30–2 to allow the Rams to return to Los Angeles and approved the Inglewood stadium project over the Carson project. The Chargers were given a one-year approval to relocate, conditioned on negotiating a lease agreement with the Rams or an agreement to partner with the Rams on the new stadium construction. On January 14, 2016, the team filed paperwork for official trademark protection of the term "Los Angeles Chargers" for the purposes of running and marketing a professional football franchise. After two weeks of negotiation, the Chargers and Rams on January 29, 2016 reached an agreement in principle on sharing the planned Los Angeles Stadium at Hollywood Park. The Chargers would contribute a $200 million stadium loan from the NFL and personal seat license fees to the construction costs and would pay $1 per year in rent to the Rams. The Chargers had continued preliminary work on a ballot initiative for public approval on a new facility. On November 8, 2016, Measure C was voted down (57% opposed over 43% in support). On December 14, 2016, at an owners' meeting, the terms of the Chargers and Rams lease agreement, as well as the team's debt ceiling were approved thus taking the first steps for a possible relocation to Los Angeles in 2017. Spanos announced the relocation in a controversial letter to San Diego Chargers fans posted to the team's official site on January 12, 2017. The team announced it would play as the Los Angeles Chargers starting in the 2017 season at Dignity Health Sports Park (then known as StubHub Center) in Carson, although the stadium seats well below the 50,000 the minimum that the NFL set even for temporary homes following the 1970 merger. The current seating for their temporary home stands at seating for 30,000 fans and is shared by the MLS soccer team, LA Galaxy. This will serve as the Chargers' temporary home field until they join the Rams in Los Angeles Stadium at Hollywood Park in Inglewood starting in the 2020 NFL season. Reaction to the relocation itself has not been without controversy. Los Angeles Times columnist Bill Plaschke welcomed the team to town by writing "We. Don't. Want. You. ", noting that "The Chargers aren't even the second team in town behind the Rams. The Chargers aren't even the third team of interest here behind the Rams and Raiders. The Chargers might not even be in the top-five favorite NFL teams in Los Angeles." At a game at the Staples Center between the Los Angeles Clippers and Lakers, the Chargers' logo was shown on a scoreboard and was "booed heartily". Chargers tight end Jeff Cumberland was also "jeered" by the crowd when featured on the big screen. One week after the move from San Diego to Los Angeles was announced, ESPN's Adam Schefter reported that the other NFL owners were "angered" by the decision, and that "the NFL wants the Chargers to move back, though nobody believes that possibility is realistic." On January 13, the Chargers fired defensive coordinator John Pagano. It took the team only one week to find a replacement for Pagano, as they hired Gus Bradley on January 20. Bradley was formerly the head coach for the Jacksonville Jaguars, and before landing that head coaching job was the defensive coordinator for the Seattle Seahawks. The Chargers also announced they had hired Anthony Lynn to be their next head coach. Their first game at StubHub Center included an announced attendance was just over 25,000, divided "around 50/50" between fans of the Chargers and the visiting Miami Dolphins. After the poor response, the NFL was reportedly considering ways to move the Chargers back to San Diego, although that possibility is considered unlikely. The league officially denied that such discussions were happening, as San Diego was stated not to have a usable stadium and that the Spanos family refuses to consider going back to the city; the league did acknowledge that a vote of the owners could change the situation. The Chargers' attendance problems continued into their second season. For instance, there were so many fans of the visiting Kansas City Chiefs at the Chargers' 2018 home opener that USA Today remarked it "was essentially a Chiefs home game". The team's struggles to draw fans have reportedly led them to lower their initial revenue goal when they move into the new stadium from $400 million to $150 million, and are causing some owners to doubt the Chargers' viability in Los Angeles. In December 2018, a Los Angeles Times columnist asked if the Chargers would receive a parade in the city if they were to win the Super Bowl. In the same piece, the columnist, Dylan Hernandez, did make note that their two most recent home games against the Cardinals and Bengals felt like home games for the Chargers. Except for color changes, the Chargers have basically used the logo of an arc-shaped lightning bolt since the team debuted in 1960. During its period in the AFL, the club also used a shield logo that featured a horsehead, a lightning bolt, and the word "Chargers". The team brought the logo back for on-field design in the 2018 season. From 1960 to 1973, the colors consisted of various shades of Electric blue ("powder" blue, but technically called Collegiate blue) or white jerseys, both with gold lightning bolts on the shoulders. The helmets were white and had both the arc-shaped lightning bolt logo, in gold or navy depending on the year, and the player's number. At first, the team wore white pants before switching to gold in 1966. In 1973, the numerals on the blue jerseys changed from white to gold. In 1974, the sky blue was changed to dark royal blue. The helmet was also changed to dark blue and the players' numbers were removed. Additionally, the face masks became yellow, thus making them one of the first teams in the NFL (with the Kansas City Chiefs) to use a facemask color other than the then-predominant grey. From 1978 through 1983, the Chargers wore their white jerseys at home, coinciding with the hiring of coach Don Coryell – when Joe Gibbs, a Coryell assistant in 1979–80, became head coach of the Washington Redskins in 1981, he did the same, and white at home became a Redskins staple through 2007 – but Coryell switched the Chargers to their blue jerseys at home starting in 1984. With the exception of the 1991 season and other sporadic home games since, San Diego wears its blue jerseys at home. In 1985, the Chargers started using navy blue jerseys and returned to wearing white pants. The team's uniform design was next revamped in 1988. It featured an even darker shade of navy blue. The lightning bolts on the jerseys and helmets were white, with navy interior trim and gold outlining. In 1990, the team started to wear navy pants with their white jerseys. From 1988 to 1991, the team displayed stripes down the pants rather than lightning bolts. The Chargers went with all-white combinations in 1997 and 2001, only to have the blue pants make a comeback. On October 27, 2003, the Chargers wore their navy pants with their navy jersey for a Monday Night Football game versus the Miami Dolphins that was played at Sun Devil Stadium, then the home of the Arizona Cardinals, due to wildfires in southern California. This remains the only game in which the Chargers have worn the all-dark combination. From the late 1980s to 2000, the Chargers wore white at home during some preseason games and dark for regular season games. In 2001, the Chargers started wearing their dark uniforms for preseason games and white uniforms in September home games due to the heat before switching back to dark in October. 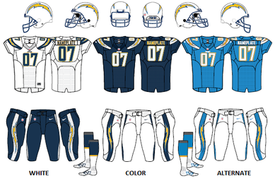 In March 2007, the Chargers unveiled their first uniform redesign since 1988, on the team's official website. The team formally unveiled this new uniform set, which mixes old and new styles, in a private team-only event. Navy blue remains the primary color on the home jersey, but the familiar lightning bolt was reverted to gold, and now has navy outlining and powder blue interior trim. The latter color is a nod to the 1960s uniforms. The redesigned lightning bolt was moved to the sides of the shoulders from the top, and includes a new numbering font and word mark in white, with gold outlining and powder blue interior trim. The pants also have a redesigned lightning bolt in gold, with powder blue trim on a navy stripe. Additionally, the team pays tribute to other uniform features from their history by wearing a metallic white helmet, with a navy face mask, the newly revamped bolt in gold with navy and powder blue trim, and white pants. The road white jerseys with navy pants, as well as the alternate powder blue jerseys with white pants, were also redesigned with the new scheme. From 2002 to 2006, the Chargers used the early-1960s powder blue uniforms as alternate jerseys, which many football fans (both of the Chargers and of other teams) clamored for the team to bring back full-time. Since 2007, the Chargers have worn the alternate powder blue jerseys twice per season. The alternate powder blue jerseys have also been worn in a playoff game against the Indianapolis Colts in 2008. In 2009, in honor of their 50th anniversary as one of the eight original AFL teams, the Chargers wore their 1963 throwback uniforms for three games. For the 2013 season, the Chargers made minor tweaks to their current uniforms. These include a two-tone nameplate (gold with powder blue trim on home jersey, navy with gold trim on away jersey, and white with navy trim on alternate jersey), collars matching the color of the jersey, and the addition of a gold stripe on the socks. On January 12, 2017, with the announcement that the Chargers were moving to Los Angeles, the team unveiled a new alternate logo incorporating the letters "LA" with a lightning bolt. The logo was immediately and widely ridiculed by fans, the media, and even other professional sports franchises, in part for its resemblance to the Los Angeles Dodgers logo. The team tried to diffuse the controversy by changing the color scheme of the new logo before scrapping it altogether after two days. The team officially announced on April 16, 2019 that it would wear its powder blue jerseys as its primary home uniform beginning with the 2019 NFL season. The club also announced that the facemask color would change from navy blue to gold, which was previously worn when the team wore its royal blue NFL Color Rush uniforms. The Chargers currently have four retired numbers: #14 (Dan Fouts), #19 (Lance Alworth), #21 (LaDainian Tomlinson) and #55 (Junior Seau). As of 2010, the Chargers' policy was to have the Chargers Hall of Fame committee evaluate candidates for a player's number to retire after the player has retired from the league after five years, Seau was the only exception to this policy. The committee consists of Chargers Executive Vice President Alex Spanos, Chargers public relations director Bill Johnston, San Diego Hall of Champions founder Bob Breitbard, and the presidents of the San Diego Sports Commission and the Chargers Backers Fan Club. There are few recognized guidelines in sports regarding retiring numbers, and the NFL has no specific league policy. "You have to have enough numbers for players to wear", said NFL spokesman Greg Aiello. The Chargers have rarely retired numbers. The San Diego Union-Tribune wrote, "The [Chargers] tend to honor their heritage haphazardly." The Chargers created their Hall of Fame in 1976. The members of the Hall of Fame are honored at the Chargers Ring of Honor, founded in 2000 and viewable above the visiting team's sideline of Qualcomm Stadium on the press level. Eligible candidates must have been retired for at least four seasons. Selections are made by a five-member committee chaired by Dean Spanos, Chargers vice-chairman. As of 1992, other committee members included Bob Breitbard, founder of the San Diego Hall of Champions; Ron Fowler, president of the Greater San Diego Sports Association; Jane Rappoport, president of the Charger Backers; and Bill Johnston, the team's director of public relations. The Chargers in 2012 allowed fans to vote for the newest member. The Chargers announced their 50th Anniversary Team in 2009 to honor the top players and coaches in the team's history. The Chargers were founded in 1959. The team included 53 players and coaches selected from 103 nominees. The Chargers originally stated that only 50 members would be selected. Online voting by fans accounted for 50% of the voting results; votes from Chargers Hall of Famers and five members of the local media made up for the other 50%. Over 400,000 votes were cast online. Dan Fouts and LaDainian Tomlinson received the first and second most votes, respectively. The team features 7 Pro Football Hall of Fame members and 11 players that were active on the 2009 Chargers team. Alworth, Mix, Hadl, Joiner, Coryell, Gillman, Garrison, Fouts, White, Winslow, Faison, Benirschke, Lincoln, Washington, Humphries, Ladd and Wilkerson are also members of the San Diego Hall of Champions, which is open to athletes from the San Diego area as well as those who played for San Diego-based professional and collegiate teams. The Chargers' flagship station is KFI 640AM in Los Angeles, commonly known as "KFI AM 640" with daily coverage and special programming on KLAC/570. Play-by-play man Matt "Money" Smith and former Chargers former offensive lineman Nick Hardwick comprise the broadcast team, with KLSD afternoon co-host Mike Costa serving as sideline reporter. Past Chargers radio broadcasters have included Josh Lewin, Ralph Lawler, Stu Nahan, Tom Kelly, Lee "Hacksaw" Hamilton, Dan Rowe, Ted Leitner, and Hank Bauer. Bauer served seventeen seasons (1998–2014) as the radio color analyst; however, the Chargers and then flagship KIOZ decided not to renew his contract, and was replaced by Conway starting with the 2015 season. As of 2014, the Chargers also stream their radio broadcasts on their official mobile application (through iOS and Android devices) as well as on their website. Most preseason games are televised on KABC-TV and KAZA-TV in Los Angeles and KFMB-TV in San Diego. KCBS-TV, besides KFMB, carries the majority of the team's regular season games; in 2015, Spero Dedes and Dan Fouts called the team's preseason telecasts. Games in which the Chargers host an NFC team on Sunday afternoons are aired over KTTV in Los Angeles and KSWB in San Diego (along with Thursday Night Football games under Fox's and NFL Network's packages); if a Sunday night game is televised, KNBC in Los Angeles and KNSD in San Diego will air the games, through parent network NBC's Sunday Night Football coverage. KABC, KCBS and KFMB are also the designated local simulcasters of the Chargers' appearances on either ESPN's Monday Night Football. Dennis Packer, the public address announcer of all USC football games at the Los Angeles Memorial Coliseum, serves as the public address announcer of all Chargers home games at Dignity Health Sports Park. Packer replaced legendary P.A. announcer Bruce Binkowski, who went on to become the executive director of the Holiday and Poinsettia Bowl games, which are played at their former home, SDCCU Stadium. With the Chargers' move to Los Angeles in 2017, the team became a beneficiary of league scheduling policies. Both the Chargers and the Los Angeles Rams share the Los Angeles market, which is on the West Coast of the United States. This means that the Chargers cannot play home games, road division games against the Denver Broncos or Oakland Raiders, or interconference road games against the NFC West (in seasons that the AFC West and NFC West meet in interconference play) in the early 10:00 a.m. Pacific time slot. In addition, they cannot play interconference home games at the same time or network as the Rams. As a result, both teams generally will have more limited scheduling options, and will also benefit by receiving more prime-time games than usual (click here for further information). Thus, regardless of the previous season's record, the Chargers will receive a disproportionate number of Sunday Night, Monday Night and/or Thursday Night games, compared to the rest of the league. Additionally, if the Chargers and Rams are both playing at the same time on Sunday afternoons on a certain network (for instance, a Rams road game against an AFC opponent at the same time as a Charger home game with an NFC opponent with both on Fox, or the reverse where the Rams are on the road against an AFC opponent and the Chargers are at home against an AFC opponent on CBS), in the Los Angeles market, Fox and CBS have authorization to carry the additional game on their secondary sister stations; Fox games air on KCOP-TV, while CBS games are aired on KCAL-TV. The Chargers' fight song, "San Diego Super Chargers", was recorded in 1979 at the height of the team's success with Air Coryell, and has a distinctly disco sound. The team under then-new owner Alex Spanos replaced the song in 1989 with a non-disco cover version, but the original version was revived in 2002. The team played this song at home games after Chargers scores and victories until it departed San Diego. From time to time during highlights of NFL PrimeTime, ESPN's Chris Berman and Tom Jackson would briefly sing the first line of the song's chorus. ^ "Chronology 1959-1969". Chargers.com. NFL Enterprises, LLC. Archived from the original on November 28, 2017. Retrieved June 10, 2018. ^ a b "Chargers Unveil New Uniforms". Chargers.com. NFL Enterprises, LLC. March 14, 2007. Archived from the original on August 11, 2016. Retrieved June 10, 2018. ^ "History of Chargers Uniform" (PDF). 2018 Los Angeles Chargers Media Guide. NFL Enterprises, LLC. September 12, 2018. Retrieved January 10, 2019. ^ "Los Angeles Chargers Team Capsule" (PDF). 2018 Official National Football League Record and Fact Book. NFL Enterprises, LLC. August 9, 2018. Retrieved November 21, 2018. ^ "OWNERSHIP & EXECUTIVE MANAGEMENT". Chargers.com. NFL Enterprises, LLC. Retrieved October 10, 2018. ^ a b c d e f g h i j k l m "History". Chargers.com. NFL Enterprises, LLC. Retrieved December 5, 2015. ^ a b "Chargers to Relocate to Los Angeles". Chargers.com. NFL Enterprises, LLC. January 12, 2017. Archived from the original on January 12, 2017. Retrieved June 10, 2018. ^ a b Knoblauch, Austin (January 12, 2017). "Chargers announce decision to relocate to Los Angeles". NFL.com. NFL Enterprises, LLC. Retrieved January 15, 2017. ^ a b Schrotenboer, Brent (January 12, 2017). "What we know about Chargers' move to Los Angeles". USA Today. Retrieved January 13, 2017. ^ "Franchise nicknames". Pro Football Hall of Fame. January 1, 2005. Retrieved December 26, 2015. ^ "Chargers pick Coliseum over Rose Bowl". Los Angeles Times. Retrieved January 17, 2016. ^ Gruver, Ed (September 1, 1997). "The American Football League: A Year-by-Year History, 1960–1969". McFarland – via Google Books. ^ SID GILLMAN Pro Football Hall of Fame. Accessed July 29, 2007. ^ Pierson, Don (January 4, 2003). "Sid Gillman 1911-2003". Chicago Tribune. ^ LANCE ALWORTH Pro Football Hall of Fame. Accessed July 29, 2007. ^ Football Players Are Better Than Ever, Right? Professional Football Researchers Association. Accessed July 29, 2007. ^ NFL's Rookie of the Year About.com: Football. Accessed July 29, 2007. ^ Florence, Mal (September 16, 1985). "Remembering the Fearsome Foursome". Los Angeles Times. Archived from the original on June 13, 2014. Retrieved June 12, 2014. ^ Big Cat Ernie Ladd World Wrestling Entertainment. Accessed July 29, 2007. ^ "Fearsome Foursome" The New Georgia Encyclopedia. Accessed July 29, 2007. ^ a b NFL History: 1961–1970 NFL.com. Accessed July 29, 2007. ^ Deacon Jones – 'Secretary Of Defense' NFLPlayers.com. Accessed July 29, 2007. ^ Litsky, Frank (September 12, 2002). "Johnny Unitas, N.F.L. 's Genius of the Huddle, Dies at 69". The New York Times. Retrieved June 24, 2014. ^ The Drug Scandal boltsfromtheblue.com. Accessed December 15, 2016. ^ "Tight end rankings: Do Sharpe, Gonzalez deserve top spot?". USA Today. July 21, 2008. ^ Pro Football Hall of Fame - "Air Coryell"
^ a b c Inside the 'Holy Roller' play NFL.com. Accessed July 29, 2007. ^ "Grambling State University Loses Two Football Legends". FoxSports.com. Fox Sports Interactive Media, LLC. August 11, 2010. Archived from the original on May 27, 2011. ^ Wilson, Bernie (July 31, 2008). "Charger-turned-Niner Fred Dean answers Hall's call". USA Today. Retrieved November 3, 2008. ^ "1981 NFL Opposition & Defensive Statistics — Pro-Football-Reference.com". Retrieved October 19, 2008. ^ "1982 NFL Opposition & Defensive Statistics — Pro-Football-Reference.com". Retrieved October 19, 2008. ^ 76: Winslow helped off field after Chargers' OT win ESPN.com. Accessed July 29, 2007. ^ DAN FOUTS Pro Football Hall of Fame. Accessed July 29, 2007. ^ Dan Fouts statistics Pro Football Reference. Accessed July 29, 2007. ^ 1981 NFL Standings, Stats and Awards Archived July 1, 2007, at the Wayback Machine Database Football. Accessed July 29, 2007. ^ KELLEN WINSLOW Pro Football Hall of Fame. Accessed July 29, 2007. ^ Thomas, Jim (July 30, 2008). "Fred Dean: Situational pass-rusher made most of his opportunities". The State Journal-Register. Archived from the original on February 7, 2016. ^ "Single-Season Passing Yards per Game Leaders". Retrieved October 22, 2008. ^ "Dan Fouts' 1982 Game Logs". Retrieved October 22, 2008. ^ Neville, David (March 31, 2003). "Little Big Man". chargers.com. San Diego Chargers. Archived from the original on February 3, 2011. Retrieved February 3, 2011. ^ Pro Football Weekly NFL Coach of the Year Answers.com. Accessed July 1, 2007. ^ Will history repeat in San Diego? Archived October 19, 2007, at the Wayback Machine CBS Sportsline. Accessed August 4, 2007. ^ Super Bowl recipe requires many ingredients USA Today. Accessed August 4, 2007. ^ Chargers are passing on a run for success The Sporting News. Accessed August 6, 2007. ^ Silver, Michael (August 30, 1999). "San Diego Chargers – After a season of discontent there's reason to be upbeat". Sports Illustrated. Archived from the original on June 13, 2014. Retrieved June 12, 2014. ^ With new coaching staff, Chargers tackling change San Diego Union-Tribune. Accessed August 6, 2007. ^ Junior Seau #55 NFLPLAYERS.com. Accessed August 9, 2007. ^ "Best quarterback class ever? Trio from '04 makes its case over '83". Retrieved September 15, 2016. ^ "Once maligned, now divine". U-T San Diego. January 7, 2005. ^ Associated Press. (October 1, 2005). Brees is NFL comeback player of year CBC.ca.com. Retrieved December 20, 2009. ^ San Diego Chargers 2003 schedule espn.com Accessed January 17, 2011. ^ Playoff box score espn.com Accessed January 17, 2011. ^ Chargers have become the NFL's star of statistics, not standings sportsillustrated.cnn.com Accessed January 17, 2011. ^ 2010 NFL stats espn.com Accessed January 17, 2011. ^ 2010 NFL player stats espn.com Accessed January 17, 2011. ^ "Norv Turner, A.J. Smith fired". ESPN. January 1, 2013. Archived from the original on January 2, 2013. ^ "Chargers hire Mike McCoy". ESPN. January 16, 2013. Retrieved January 30, 2016. ^ Florio, Mike (December 20, 2014). "2016 becomes the target for an L.A. move". ProFootballTalk. Retrieved January 15, 2016. ^ Farmer, Sam (February 20, 2015). "Chargers, Raiders will jointly pursue an NFL stadium in Carson". Los Angeles Times. Retrieved January 15, 2016. ^ Bien, Louis (January 4, 2016). "Rams, Raiders and Chargers file for relocation to Los Angeles". SB Nation. Retrieved January 13, 2016. ^ Daly, Thomas J. (January 22, 2016). "Are the San Diego Chargers Moving to Los Angeles?". The National Law Review. Lewis Roca Rothgerber LLP. Retrieved January 23, 2016. ^ a b Acee, Kevin; Garrick, David; Wilkens, John (January 29, 2016). "Chargers here for a year -- then what?". San Diego Union-Tribune. Retrieved January 30, 2016. ^ Plaschke, Bill (January 11, 2017). "Message to Chargers: We don't want you in Los Angeles". Los Angeles Times. Retrieved January 17, 2017. ^ Togerson, Derek. "Chargers Logo Booed at Staples Center". NBC San Diego. Retrieved January 17, 2017. ^ a b "Los Angeles Chargers logo booed at Clippers-Lakers game". The Guardian. Retrieved January 17, 2017. ^ Schefter, Adam. "Mover's remorse in San Diego". ESPN.com. Retrieved February 1, 2017. ^ Wold, Rachel (January 13, 2017). "John Pagano found out he was fired by Chargers through media". Sportsnaut. Retrieved January 13, 2017. ^ Rosenthal, Gregg (January 13, 2017). "Chargers hire Anthony Lynn as their new head coach". National Football League. Retrieved January 15, 2017. ^ "Los Angeles Chargers Hire Anthony Lynn as Head Coach". Los Angeles Chargers. January 13, 2017. Retrieved August 27, 2017. ^ Markazi, Arash (September 17, 2017). "Chargers games are actually loud! There's just one problem". ESPN. Retrieved September 25, 2017. ^ Farmer, Sam (September 22, 2017). "Chargers moving back to San Diego? Not much of a chance". Los Angeles Times. Retrieved September 25, 2017. ^ Rapoport, Ian (October 8, 2017). "No discussions of Chargers moving back to San Diego". NFL.com. Retrieved October 8, 2017. ^ Joseph, Andrew (September 9, 2018). "Visiting fans are taking over Chargers' stadium". USA Today. Retrieved September 20, 2018. ^ Graziano, Dan (October 17, 2018). "Sources: Owners discuss viability of LA Chargers". ESPN.com. Retrieved October 17, 2018. ^ "Chargers' win raises a serious question for L.A. and its football fans". Los Angeles Times. December 2018. Retrieved December 9, 2018. ^ Henne, Ricky (June 24, 2013). "Chargers Tweak Jerseys for First Time Since 2007". Chargers.com. NFL Enterprises, LLC. Retrieved June 22, 2016. ^ Axson, Scooby. "Chargers reveal new logo after announcing move to Los Angeles". Sports Illustrated. Retrieved February 1, 2017. ^ Stickney, R. "Fans Roast New LA Chargers Logo". NBC Los Angeles. Retrieved February 1, 2017. ^ Hamblin, Abby. "Other sports teams roasted the Chargers for their new logo, L.A. move". San Diego Union-Tribune. Retrieved February 1, 2017. ^ Florio, Mike (January 12, 2017). "Report: Chargers may rebrand in L.A." NBC Sports Pro Football Talk. Retrieved January 13, 2017. ^ Florio, Mike. "Chargers admit mistake, ditch initial L.A. logo". ProFootballTalk. NBC Sports. Retrieved January 17, 2017. ^ Wilson, Ryan. "Chargers: New L.A. logo a mistake, team 'miscalculated how it would be received'". CBS Sports. Retrieved January 17, 2017. ^ Hamblin, Abby. "L.A. Chargers' new logo officially dead. Our job here is done". San Diego Union-Tribune. Retrieved February 1, 2017. ^ Henne, Ricky (April 16, 2019). "Iconic Powder Blues to Serve as Chargers' Primary Jersey in 2019". Chargers.com. NFL Enterprises, LLC. Retrieved April 17, 2019. ^ Scholfield, Steve (July 14, 2005). "Chargers to honor AFL icon Alworth". North County Times. Archived from the original on May 13, 2012. ^ Sullivan, Tim (August 15, 2006). "This time, icon finally receives proper sendoff". The San Diego Union-Tribune. Archived from the original on May 14, 2012. ^ Hood, Lindsay (October 21, 2010). "Chargers Fun Fact: Team Hall of Fame". NBCSanDiego.com. Archived from the original on March 5, 2012. ^ "San Diego Chargers A–Z Fan Guide" (PDF). Chargers.com. NFL Enterprises, LLC. 2011. p. 19. Archived from the original (PDF) on March 5, 2012. ^ a b Judge, Clark (November 29, 1992). "With week to go, Raiders blackout likely". The San Diego Union-Tribune. Sports section. ^ Gehlken, Michael (July 16, 2012). "Fans to decide next Chargers Hall of Famer". U-T San Diego. Archived from the original on July 30, 2012. ^ "Celebration announced for 50th season of Chargers football". Chargers.com. The San Diego Chargers. Archived from the original on October 13, 2011. ^ "Chargers 50th anniversary team". The Press-Enterprise. Archived from the original on August 26, 2011. ^ a b Canepa, Nick (November 16, 2009). "Greatest Chargers list rings true". The San Diego Union-Tribune. Archived from the original on October 13, 2011. ^ a b "Fans to select 50 greatest Chargers". Chargers.com. The San Diego Chargers. Archived from the original on October 13, 2011. ^ Bigelow, Bill (November 28, 2009). "Fouts chosen as all-time 'Greatest Charger'". The Bulletin. Archived from the original on March 3, 2012. ^ Williamson, Bill (November 17, 2009). "Chargers announce their all-time team". ESPN. Archived from the original on March 3, 2012. ^ "Fouts, Tomlinson top vote-getters for All-Time Greatest Chargers". Chargers.com. Archived from the original on March 3, 2012. ^ "Chargers find broadcast home at iHeartMedia-LA's KFI-AM 640 – AM 570 LA Sports". ^ "Hank Bauer out as analyst for Chargers' radio broadcasts". Retrieved September 15, 2016. ^ "Official Chargers Mobile Apps". September 24, 2014. Retrieved September 15, 2016. Wikimedia Commons has media related to Los Angeles Chargers.